Arsenal midfielder Jack Wilshere claims a new gluten-free diet has put him in the best shape of his career. Wilshere starred in a thrilling 2-2 draw at home to Chelsea on Wednesday, opening the scoring with a thumping close-range finish. It was not enough to earn Arsenal victory, with Eden Hazard's penalty and a late goal from Marcos Alonso putting Chelsea in front, before Hector Bellerin added a final twist in stoppage time. A point was the least Wilshere deserved for another industrious display in central midfield, which represented his sixth consecutive 90 minutes in the Premier League. After enduring a nightmare few years with injury, he explained how a new diet has transformed his physical condition. 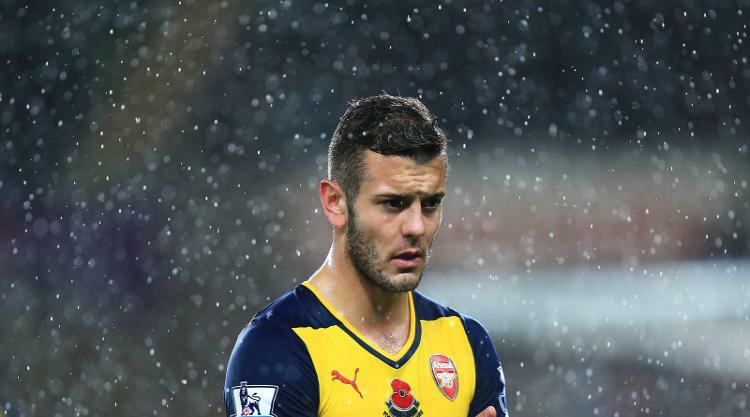 "I have been dairy and gluten-free now for six weeks," Wilshere told the London Evening Standard. "I feel that I look better, I have certainly lost a bit of weight, and am leaner. I am probably fitter as well. I feel sharper and quicker on the pitch. I feel like I can last longer. "For example, at the end of the Chelsea game when we scored the second goal, I felt, 'Come on, we can go on again here'. I was pressing them and felt good. "I know my body well, I know the right foods to eat and the best way to recover. I'm also getting the right amount of sleep. "I've learned that over the years and I think I'm in the best shape I have ever been." Wilshere told Sky Sports after the match there had been "no progress" in talks regarding an extension to his contract, which expires at the end of the season. But his performances will not have gone unnoticed by England manager Gareth Southgate, who has challenged Wilshere to play regularly for Arsenal before thinking about an international recall. For Arsene Wenger, however, the game brought mixed feelings given his side enjoyed the better of the chances at Emirates Stadium and looked on course for a statement win. Arsenal defender Shkodran Mustafi admitted the draw felt more like a defeat. "It feels more like a defeat than like a winning equaliser," Mustafi told the official club website. "Unfortunately it was not too entertaining for us. We were dominant in the first half and I think we had the first opportunities." Arsenal now turn their attention to their FA Cup third-round tie at Nottingham Forest on Sunday.